Benjamin Johnston Wardill (1842-1917). Represented M.C.C. Baseball Section from 1888-1889, Secretary M.C.C. Baseball Section 1889-1910, M.C.C. Secretary 1879-1910. Victorian Baseball League President 1896-1898, 1907-1909. Wardill was key to the establishment of the Baseball Section and its secretary from 1888 to 1910. Wardill was an influential figure in the development of the Baseball Section, whether it was inviting visiting US officers to play Baseball on the MCG, involvement with the Spalding tour, funding the equipment for Baseball, even pulling on the uniform in the first couple of seasons. We would not have a Baseball club without his volunteering spirit. The very numerous friends of Major B. J. Wardill will learn with deep regret, of his death, which took place shortly after 1 o'clock last night, on the 75th anniversary of his birth. For the preceding 12 hours he had been in a comatose state, and gradually sank until he passed peacefully away. Major Ben as he was known – his rank was honorary, betokening his enthusiasm as a volunteer in the local militia, was for many years one of the foremost figures in the cricket world of Australia. As secretary of the Melbourne Cricket Club he had the management of the English cricket teams brought out by the club. He was born on October 15 1842, at Everton, near Liverpool, and was educated at the Collegiate institute, Liverpool. He arrived in Victoria in 1861, and was for many years a clerk in the Colonial Sugar Company. He was elected secretary to the Melbourne Cricket Club in April 1879, served 31 years, was busy, business like, with a neatly trimmed Mark Twain moustache he became what The Australasian Star called “an International Institution”, he was key to the establishment of the Baseball Section and its secretary from 1888 to 1910. 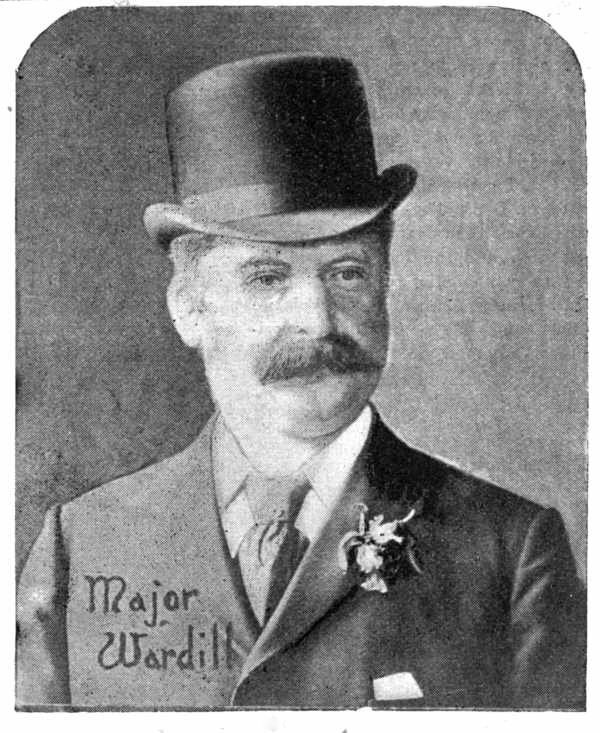 Wardill was largely successful in his aim to make the Melbourne Cricket Club the Australian counterpart of the famous Marylebone Cricket Club in England, his influence on Charles Bannerman, F. R. Spofforth, Clem Hill, Victor Trumper and others helped them lay the foundations of the Anglo-Australian Test cricket series and established the M.C.C as a multi discipline sporting club. He retained the Secretarial position of the Cricket and Baseball sections until December, 1910, when, owing to ill health, he resigned. The committee of the club, grateful for his many services, granted him a pension, and a public testimonial was also given him. So wide was the respect in which he stood that His Excellency the Governor General (Lord Dudley) presided at the public meeting called to organise the testimonial, and the committee which carried it out was representative of all sections of the community. When Major Wardill assumed the secretaryship of the Melbourne Cricket Club in 1879 there were 572 members, and the income was £2,943. In the year of his retirement the roll had reached 5,353 members, and the revenue was £13,000. During his 31 years of service the ground had developed from a very ordinary cricket oval to one of the finest in the world. Mr. Wardill was manager of three Australian teams which toured England, and his fame as a cricket organiser was world-wide. "The Major," as he was known to thousands, was as popular in England as he was in Australia. He was an enthusiastic volunteer in the days when enthusiasm counted for a great deal, and at a time, too, when such vitality as the defence system could be of was due to earnest men of his type. He served in the Garrison Artillery, and, having received a commission, rose rapidly to a majority. He organized and managed the 1886 Australian tour of England which was arranged by the club and later managed the tours of 1899 and 1902. Wardill was also a capable all-round sportsman; as a cricketer he was a solid batsman and a useful round-arm bowler, playing once for Victoria in 1866. He was a fine rifle shot, and was a member of the team organised in 1876 to visit the United States in connection with the Philadelphia Centennial Exhibition. The team subsequently competed in England. In 1908 Major Wardill met with a serious accident, and it was mainly owing to this that he found it necessary to retire. Shortly after his resignation, Major Wardill visited England, but soon returned, and ever since he has lived near Melbourne. For some considerable time he had lived at Sandringham, and hardly a day passed without a visit from some of his old friends. Mrs. Wardill, who survives him, is a daughter of the late Mr. J. C. King, formerly general manager of "The Argus." a daughter had died in infancy. The Major had a stand named after him in his honour at the MCG, it was erected in 1912 with a capacity of 8000. It was demolished in 1936 to make way for the Southern Stand.